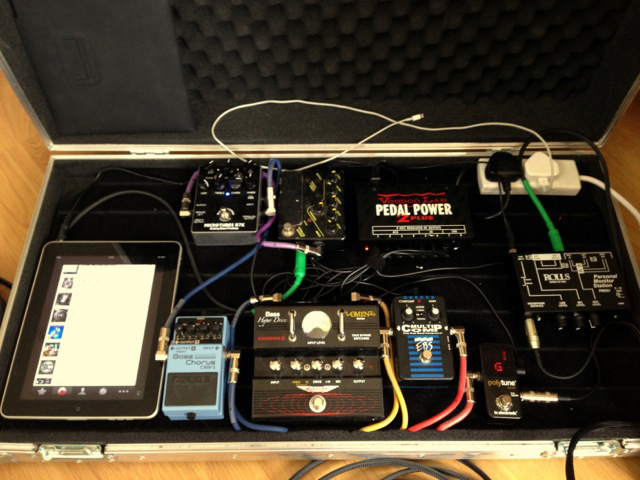 Today’s pedal line is from Rich Webber. If you have a pedal line (doesn’t have to be in a board) for your rig, please email me a photo, bio, description of pedals and routing to pedalline@nulleffectsbay.com. Every Friday I’ll showcase a pedal line submission. Make sure you include any links to your band or music page. I’m Rich, the bass player with the band MG & The Juggernaut, in the UK & I wanted to show you my current board with a few of the awesome pedals i use..
-Everything is powered by a Voodoo Labs Pedal Power 2+. I used a daisy chain power lead previously, and couldn’t see the benefit of an expensive dedicated power supply before. Then i heard how quiet & clean the board became afterwards……! The couple of obvious questions i get asked are why i need both the B7K and the Sansamp at the same time & why i have an iPad strapped to the board! Firstly, i don’t use a bass amp in the traditional way. The board is set up so that no matter what venus/sound person i get stuck with, there is no variation from night to night with the core of my sound. Usually i’ll either go with just a power-amp / speaker, or purely by DI. This is very much venue-dependant. The same idea applies to the band in-ear monitoring, creating a 100% consistent and reliable system. The B7K would normally drive the power amp exclusively (taken from the output jack), which for rehearsals was fine. My issues arose with sound engineers at various venues who seemed to struggle with the really hot output from the XLR, as i was REALLY pushing the pedal to get the volume i needed into the power amp, so the XLR signal was also super-loud. This invariably meant that my overdriven ‘sound’ to the amp ended up being compromised as i backed off to help the engineer get a controlled level, which became an irritation. The addition of the Sansamp is purely to control that volume back down to a reduced level to an alternate XLR for the sound guy & isolated from the signal to the amp. Everything is set flat & purely passing the signal through. It also provided a better signal to send to the Rolls PM351. The iPad allows me to have a self-contaned way of practising silently through the board, via the Rolls PM351, so great for between-gig downtime. It also allows the band to silently run backing tracks/clicks to the other band members ears via iOS apps like SoundCue. The only thing i really would like to add to the board is a good low-filter, to clean the headroom chewing sub sounds sent to the amp. The Thumpinator is the only current choice, as the fDeck annoyingly isn’t available to the UK.